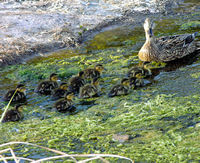 We got a call from Mary telling us there was a Mama Duck with chicks following her down the street. Since it was after hours, we had to deal with it ourselves. 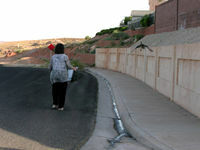 Mary said she had to get off the phone because a neighbor was backing out of the driveway and would run over the ducks. 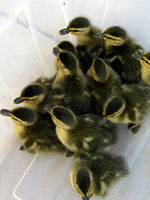 By the time we got there, all eleven chicks had been captured and placed in a big plastic tub. We tried unsuccessfully to capture Mama with a net, with our hands, and surrounding her in a circle and gradually closing in. She would fly over our heads, but stay not far from her chicks. So, we started the 3 block walk to the park where there is a little water. Yes, Mama followed all of the way! 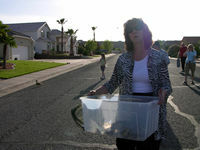 We put the chicks into the water. They were all facing south. Mama came from under the bridge to the north. 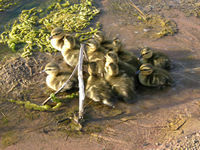 One quack and the chicks instantly turned and swam toward Mama in unison. Too bad human kids aren't so fast to obey! Anyway, all were happy to be back together. They quickly found a hiding place under some plants in the water. What a great experience. Enjoy the pictures. Click on any picture to view a larger version.